Specimen mounts of different sizes are placed in the outer ring of the holder base. The center hole of the base will hold a bottle of conductive adhesive. One side of the base takes 10 of the ⅛" pin mounts; reverse side takes 10 of 10 to 15mm diameter mounts. A SEM specimen preparation stand with the ability to hold pin mounts on a 45° angle as well as in a vertical and horizontal direction. The stand, which is made from Aluminum, comes complete with screws that are used to secure the mount during preparation. Both ½" (12.7mm) and 1" (25mm) mounts can be accommodated on the stand. This stand is made from Aluminum and measures 2.4" (61mm) x 0.63" (16mm) and provides a stable surface for a variety of pin mounts. This stand is ideal for either storage and or specimen preparation of mounts. Made from Aluminum and has the capacity to hold up to 40 x ½" (12.7mm) pin mounts or 12 of the 1" (25mm) mounts. Measurements: 5.39" (137mm) x 3.5" (89mm) x 0.63" (16mm). Press these self-sticking adhesive tabs to the surface of an SEM mount, then lift off tab for applying the sample. Each box contains 72 sheets of 36 tabs each. Non conductive. 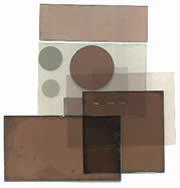 Standard Carbon Conductive Adhesive Tabs– Tabs are formed by two sides of thick conductive adhesive (45 µm on each side) with the center conductive core film (35 µm). With the total thickness of 125 µm, these tabs will offer reasonably firm, smooth surfaces for a variety SEM applications, including gunshot residue analysis. Tabs are protected by white liners, which do not have to be removed when samples are ready to be mounted. Thick Carbon Conductive Tabs or Image Tabs –The stiff and smooth surface conductive tabs are 260 µm thick, including 200 µm thick conductive carbonate base, coated 30 µm thick on each side with conductive adhesive. However, these tabs are not as conductive and sticky as the Standard Carbon Conductive Tabs. Thick Carbon Conductive Tabs are used for photographic background as well as for Jet Scan applications, where the tabs must be removed and filed away. Ultra-Thin Carbon Conductive Adhesive Tabs –These tabs have Core material which is nonconductive cloth (70 µm) with Carbon Filler Conductive Adhesive (2 x 45µm). Total thickness is 160 µm. Ultra-Smooth Carbon Adhesive Tabs– Carbon adhesive tabs that eliminate issues with rough surfaces, insufficient tackiness, and hardness with significantly lower contaminant levels under EDS. Tabs are made in USA and very popular, and may be used in place of other conductive adhesive in many applications in conventional and field emission microscopes. They are also widely used in forensic laboratories for study of gunshots residues. Without the addition of conductive coating, small nonconductive particles can often be imaged and X-Ray analyzed, cutting down your analysis time. These tabs are composed of a thin film of strong adhesive approximately ½" diameter. Over 99% transparent to EDS, with a very small amount of nickel (0.6%) and copper (< 0.3%). This ½" (12mm) diameter conductive tabs are similar to our adhesive tabs, but they work like carbon adhesive tabs. Just remove tab from the roll, press onto surface where you want the film, lift "tab" and peel it off. The tabs can be cut to desired size before being removed from its backing, for use on smaller samples. An affordable double-sided conductive tab for all SEM samples. Excellent adhesive for all paper pasting and mountings of drawings and photographs. It is also used to adhere specimens to SEM Stubs. Any excess cured cement can be easily removed. A 4 oz bottle comes with a brush in the cap. This low temperature mini glue gun is safe and allows for the easy application of the melt glue to the aluminum stub for the mounting of bulk or irregular shaped specimens for SEM. (See reference in Technical Tip #7 of this issue). Comes complete with a 40" cord, and two glue sticks. Accepts 5/6" diameter all temperature or low temperature glue sticks. 110 volt, 10 watts. 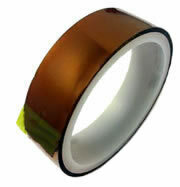 With the same technical properties of our 77802 shown above this conductive tape is 12.7mm(W)x16.4m(L). Minimum impurities - Maximum conductivity. Produces minimum gas under vacuum conditions. 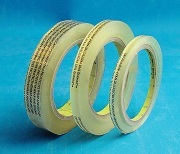 to use in all applications requiring a conductive tape. Produces discs (tabs) from sheet materials. Ticket punching type. Comes with adjustable side gauge for centering hole, 2" maximum reach. Weight 10 oz., 6½" long. 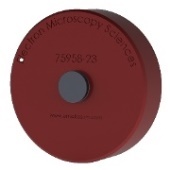 Useful for punching adhesive tabs for specimen mounts, or producing circle cover slips from ACLAR® films (EMS #50425 or #50426) for growing cells.